There’s always one. One film in each year’s After Dark lineup that leaves me stunned as the credits roll up the screen. I felt that way about Resolution, about Let The Right One In, and about The Battery in the past, and I feel the same about Shut In. This awesome twist on the home invasion thriller is definitely going to be one to keep an eye on, for so many reasons. Three thieves, including a dark and villainous Martin Starr (Freaks and Geeks, Dead Snow 2, Silicon Valley), break into the home of grieving Anna (Beth Riesgraf), an agoraphobic who hasn’t so much as stepped off her front porch in ten years. When Starr’s character points this out, we are treated to what I’m almost positive is the first time a home invasion thriller of this type features an assailant throwing the victim out of the front door. It's certainly the first time I've seen such an act be a truly, affectingly disturbing one. It’s a low bar set by bad reality television like Hoarders, but never has a hermit's abode looked so lush and beautiful. Shut In is consistently shot with care, attention, and style for days and nearly any still you take from the film is as well-composed as a painting, a massive credit to director Adam Schindler and cinematographer Eric Leach. It’s an easy choice to use a drab or washed-out palette like many films such as Panic Room have employed to great effect, but Shut In bucks that trend with the use of rich colours and vibrant patterns throughout. Like in Housebound, the setting of the mansion is the real star here, with each room in the sprawling, labyrinthine house displaying a distinct personality. As the film wears on and we see what lies beneath the surface of the beautiful home, it mirrors the tension being experienced by every character. Every scene in Shut In is meticulously composed to wring as much tension as possible. Beyond the setting, Shut In manages to overturn conventions by introducing the idea of agoraphobia into a home invasion thriller, which asks an intriguing question - what if opening the door and running outside is a scarier prospect than dealing with the invaders on your own turf? Riesgraf plays the agoraphobia and the general paralyzing tension so well throughout, and often without any dialogue at all. Martin Starr, known almost exclusively for comedic work, is truly frightening and unhinged here as well and I can't wait to see him break out into more serious fare after his deft handling of the role here. With a tight script with several unpredictable left turns, writers TJ Cimfel and David White have crafted a story that fully immerses the viewer in the closed-off, internally tense world of Anna while presenting some legitimately new ideas in a subgenre of horror that has seen it all. With so many talented people at work on Shut In, this is one not to miss. 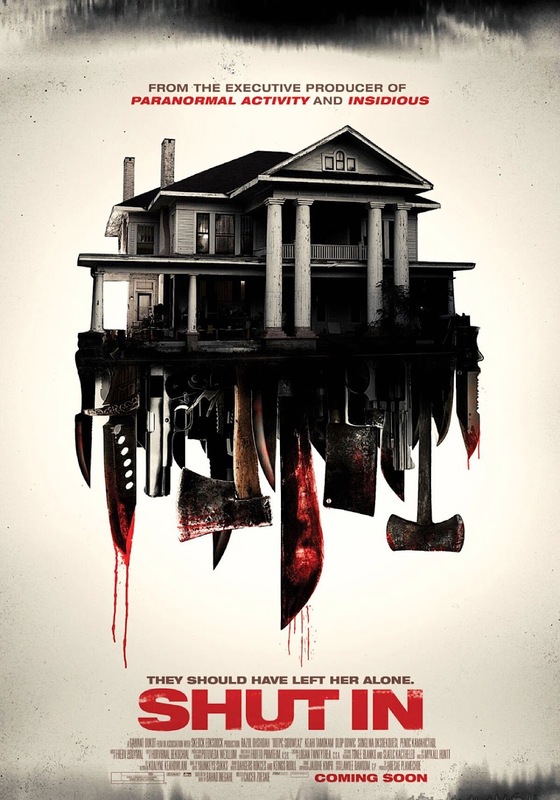 The pretty cool poster for SHUT IN!